EVEN THOUGH WE ARE ONLY TWO ROUNDS INTO THE SUNCORP SUPER NETBALL, A DEFINITE PATTERN IS FORMING AROUND LONG RANGE SHOOTING. The pattern reveals which teams have long range shooting options and which teams follow a more conservative approach by having their shooters positioned underneath or near the goal posts. Having long range specialist shooters doesn’t necessarily translate into ladder position but it does translate into exciting netball and increased crowd noise. 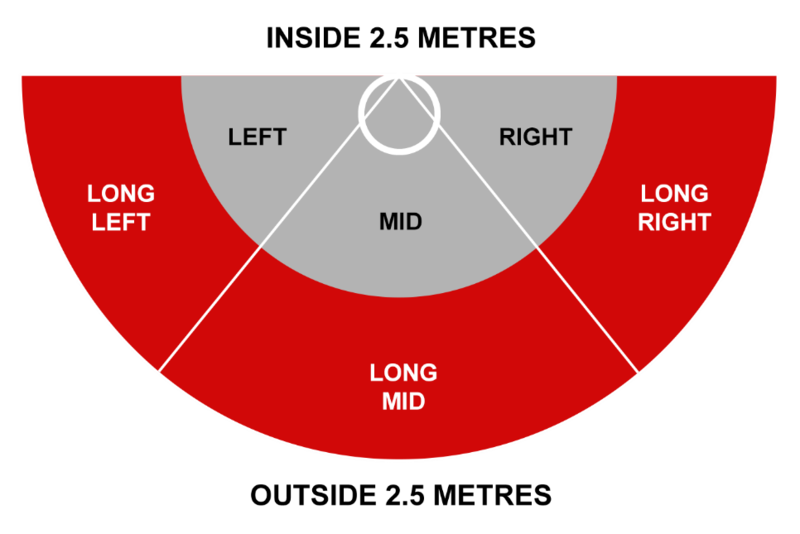 All scoring attempts (goals and misses) are split into six scoring zones. Then within each area the shooting circle is split up into short and long. Currently the Thunderbirds (35% of attempts) and Vixens (31% of attempts) are the teams with the longest range with Erin Bell (Thunderbirds) and Tegan Philip (Vixens) attempting the most long range shots. Whilst attempting the long bomb can be exciting, getting the goal in is where the real excitement is. Long range is an area where the Thunderbirds and Erin Bell are potentially wasting opportunities, as Erin is currently shooting at 56% from the long bomb area – 18 goals from 32 attempts. The Vixens’ Tegan Philip is quite effective from afar, with 23 from 30 with a shooting percentage of 77%. The two teams with the fewest long range attempts are the Lightning, with only one miss from one attempt and the Firebirds, with five goals from six attempts. Gretel Tippett has scored the five goals for the Firebirds, with Romelda Aiken missing one attempt. Caitlin Bassett (Lightning) and Romelda Aiken (Firebirds) aren’t known for their long range effectiveness, but they don’t need to be as the long pass into them under the goal posts is a tactic that has worked very effectively for them over the years. The most effective long bomb specialists in the competition to date are Gretel Tippett (Firebirds) with 100% but from only five attempts. Caitlin Thwaites (Magpies) has a very impressive long range shooting percentage of 91% – 10 goals from 11 attempts. Next best is Natalie Medhurst from the Fever with seven from eight for a long range shooting percentage of 88%. Does long attempts translate into a winning success? At this stage of the season no, but it does bring the crowd into the game by creating an exciting brand of netball and creates a situation where your team is not one dimensional in the shooting circle. Give me a screaming crowd and well-timed long bomb any day….